Home › Funny Little Moments › “Moving Sale–Guy Stuff” or Chicken Piccata! 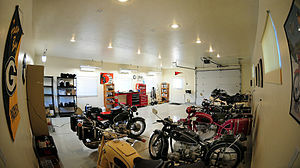 A really cool “Man Cave’, but is it Moving? Well I’m back from Alaska. I hope you enjoyed the Cycling Alaska Posts from 4000 miles away. It was an amazing experience, and I can now check off one of the things on my bucket list. I’m sharing one last picture of a road sign we passed while in Alaska. I’ve seen many moving sales signs in the past, but not a one specifically indicating ‘guy stuff’. That caused our riding group to speculate on what might be prompting such a unique sale. After 250 miles of riding together, we were desperate for new discussion material. One of the guys suggested they were selling their stuff in phases, and since ‘guy stuff’ was usually under foot, it was the easiest to sell first. Ok that works. Another is that his wife was unreasonably demanding he remove his guy stuff from the living room, garage or man-cave, otherwise HE was going to be moving. Certainly a possibility. And there was no downside to cooperating with his wife’s demands because he secretly knows guys don’t buy other guys stuff . That’s one of the basic guy rules we learn when we are about 10. Another offers the guy ran out of wall room for all the moose and bear heads, and he was selling some of the ‘older’ heads to make room for ‘newer’ heads. So he was just ‘moving things around’, not really moving. That one got a lot of traction, because every guy has done that. It’s basic guy behaviour. Another suggested it might be a guy with a new girlfriend hoping to convince her to move in, and he’s making an effort to self-police his place to impress and make room for his new roommate. No one took that one very seriously. Real guys don’t self-police themselves. Us guys were having some fun with this speculation, when the lone woman riding companion told us we weren’t even close! She said the sign was too well-printed to be the handiwork of a man. Therefore, she concluded the sign was prepared by a woman. She had a point there. She then went on. Assuming the sign is the work of a woman, then there are only a few possible situations. Most probably, the lady of the house has already ‘moved out’ the man of the house, and she is disposing of his “guy stuff” in the quickest and most profitable way possible. Why burn it when you can get a few bucks for it? The other possibility is she has threatened to put his head on the living room wall next to the moose and bear heads if he didn’t do something about his stuff –NOW! Did I mention in my Cycling Alaska posts that everyone has rifles in Alaska, including the women? This one sounded plausible too, because in this case the guy is ‘moving’ from the living room chair to the living room wall. Therefore, the sign was painted by the lady while the guy collected his stuff and put it outside for the sale. The rifle was loaded and standing ready if he delayed one more moment. Us riding guys bought this one too because we have occasionally experienced this attitudinal shift in the women in our lives at home. It’s usually not a pleasant experience. And usually the word ‘moving’ enters the discussion often and that word can have many meanings. It also occurred to us that the guy might be moving into his girlfriend’s place, and she said, “come alone, and with one suitcase” because she had previously seen his ‘guy stuff’. That’s a real possibility. After a few nervous laughs among us guys, we agreed the poor soul was in trouble. I suggested we help him out. We should go back and give him the internet address for “Two Men and a Truck”. He most likely needs the help moving from some friendly men. It would be a long shot, but he might be able to recover the gun if he cooked her a great dinner. Nice thought, but we were too far down the road by then. Furthermore, the lady rider suggested we might actually get ourselves shot trying to help this guy out! Apparently, one of the rules 10-year-old girls learn is that when pissed off at one guy, you are allowed to treat all other guys the same way until you are over it. Yep, we had seen that rule in play before. Let’s keep riding. Now, had I had the chance to talk with this fellow, I’d have to assume he’s not the smartest guy in the world to get himself into this corner. So I’d offer up one of the fastest, easiest, simply elegant and delicious dishes I have in the my Collection, because as we already acknowledged, there may not be a lot of time or room for error here. 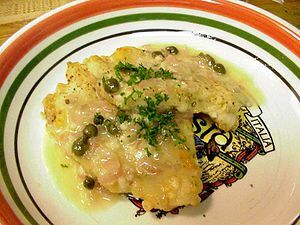 Here it is–Chicken Piccata. This is always a favorite, and trust me, it is pathetically easy. Yet, it’s one of those dishes most people only order in restaurants. I have personally used this recipe for ‘recovery’ situations with my Kathy, and it works almost every time. Yeah, sometimes nothing works. Serve it with a nice bright-colored salad and some fresh green beans, and maybe you can recover one or two of your most favorite guy things from the yard sale! Give this one a shot guys because it works. 2. Dredge chicken in flour and shake off excess. 3. In a large skillet over medium high heat, melt 2 tablespoons of butter with 3 tablespoons olive oil. 4. When butter and oil start to sizzle, add 2 pieces of chicken and cook for 3 minutes. When chicken is browned, flip and cook other side for 3 minutes. Remove and transfer to plate. Keep warm. 5. Melt 2 more tablespoons butter and add another 2 tablespoons olive oil. When butter and oil start to sizzle, add the other 2 pieces of chicken and brown both sides as in 4. above. Remove pan from heat and remove chicken to the plate. 6. Into the pan add the lemon juice, wine, stock and capers. Return to stove and bring to boil, scraping up brown bits from the pan for extra flavor. 7. Check for seasoning. Return all the chicken to the pan and simmer for 5 minutes. Remove chicken to platter. 8. Add remaining 2 tablespoons butter to sauce and whisk vigorously. Pour sauce over chicken and garnish with parsley. A. The wine, lemon and stock quantities are a good balance for this recipe. If you do not have wine or prefer not to use it, replace it with a bit more lemon and more stock. B. Excellent recipe and very easy.